Transport Action BC's Matthew Buchanan reports: "I have been using OpenStreetMap a lot recently. While similar to other web maps such as Google, Bing, and Yahoo Maps, there are key differences. For one OpenStreetMap is editable by anyone, all it takes is a user name and password to start editing. It has been described as the Wikipedia of maps. It is also possible to fix mistakes in the map right away, while the big online maps are updated a lot less frequently. OSM has a lot more bike paths, pedestrian paths, bus stops, train stations that the big guys don’t have. An advantage to non-profits like Transport Action, is that OSM maps can be published, copied and printed without restriction. 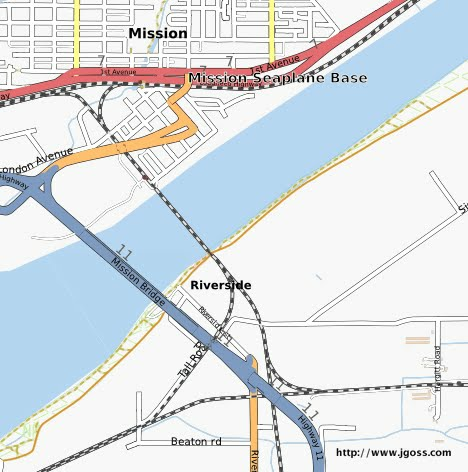 Buchanan demonstrates an OpenStreetMap with a rendering of the Mission Bridge area. "It shows the West Coast Express station in Mission and the two VIA Rail stops in the vicinity, which I suspect aren’t widely known about. The Abbotsford stop (it can’t be called a station since it is just a platform) serves trains bound for Vancouver only, the Mission Harbour stop serves eastbound trains only," Transport Action BC's president reports. Transport Action Prairie, What is the plan for shortline railways? The Winnipeg Free Press reported; "Most of the railway branch lines have been ripped up. Farmers are once again feeling captive. Once a farmer has loaded a semi and hauled grain 100 kilometres or so to the nearest grain terminal, how likely is it that he or she will turn around and go elsewhere if the offered price is unsatisfactory?" "Not surprisingly, producer-car use has surged again over the past 15 years or so as farmers invest in their own grain-loading facilities to bypass the country elevator system. There are 120 producer-car loading sites scattered across the Prairies. Not only that, but producer-car shippers have been the main investors in the 14 short-line railways that now exist across the West," Laura Rance, reported for the Winnipeg Free Press on Sep 10 2011. Transport Action Prairie's Peter Lacey notes the organizations has been a key player in the shortline renaissance. "Transport Action wants to know what the government's plan is for the industry. Using shortlines, farmers have been saving a lot of money in transportation costs and taxpayers have saved on road costs," Lacey says. L’association Transport 2000 Québec salue cette initiative et la pertinence d’un débat public sur les politiques d’aménagement des municipalités et de l’agglomération métropolitaine. Ainsi, les acteurs et les groupes en présence ont pu débattre de leurs positions respectives sous le regard des médias présents malgré une actualité florissante. Bref, c’est le président du conseil de Transport 2000, monsieur Robert Dubé, qui exposera dès 19 heures les orientations et préoccupations de l’organisme devant les commissaires. La volonté de la CMM de concentrer 40 % des nouveaux développements autour d’axes efficaces de transport en commun (TOD) est loin d’être considérée déraisonnable et fait largement consensus en son conseil d’administration. De plus, Transport 2000 encourage les municipalités à se montrer proactive afin d’améliorer la convivialité des espaces publics et l’accessibilité aux transports collectifs. En revanche, les administrateurs ont trouvé peu de place en termes de développement économique et social dans ce plan directeur, un élément pourtant identifié dans le thème même de la démarche. Transport Action's Barry Wellar was a guest on the Kitchener 570 News Jeff Allan Show, on Oct, 13. He emphasized that pedestrians are a large and necessary component of urban traffic. Wellar said municipalities need to ensure that roundabouts and enter-exit roadways are designed and maintained to assign highest priority to the safety, comfort, and convenience of pedestrians. “The Journal of Public Transportation is published quarterly by the National Center for Transit Research. It is unlike most academic journals in that it is free!” Vancouver blogger Stephen Rees reports. Can changing the way we pay for roads, parking, insurance and emergency costs help improve mobility, accessibility, air quality, fuel conservation and the state of the province’s transportation infrastructure? How would changing the way we pay for transportation positively or negatively affect Ontario's citizens and businesses? Transport Futures provides a non-partisan venue where road pricing, parking fees, gas taxes and other financial measures are rationally discussed by government, business, labour organizations, NGOs, professional associations, academia and citizens-at-large. You are invited to join the discussion! "The $2 million annual financial support to keep the Cape Breton portion of the Truro-Sydney line in good operating condition is trivial compared to the hundreds of millions of dollars of taxpayers money which subsidizes our provincial highway system each year. In fact, $2 million would only build 2 kilometers of two-lane road somewhere in Cape Breton," John Pearce, past president, Transport Action Atlantic wrote in a letter to editor of the Halifax Chronicle-Herald. "Rail freight transport is key to developing the Port of Sydney and almost any sort of heavy industry, mining or marine transport in the area. Rail is 3 times more fuel efficient than truck for carrying containers and other lighter goods, and 6 to 8 times more efficient for products such as paper, gypsum, coal, natural gas liquids, and other chemicals. With the cost of increasingly scarce transport fuels continuing to rise, fuel efficiency is key to controlling transportation costs for products passing through the port at Sydney or originating in CBRM, just as it has been for NewPage paper in Port Hawkesbury which relied on rail for 75% of its shipments," the Oct. 13 Halifax Chronicle-Herald letter said. "The Coalition for Algoma Passenger Trains (CAPT) has received a blessing from city council to work toward developing passenger train service in the region. City council endorsed its support to CAPT through a resolution Tuesday. CAPT's mandate is preserving and enhancing remote passenger train service in the District of Algoma as well as the adjacent districts around Hearst and Sudbury. The group is composed of municipalities, First Nations, tourist resort operators, cottage/camp-owners, recreationalists, environmentalists, ACR employees and retirees, community economic development professionals and accessibility groups, particularly along the Algoma rail lines from Hearst to Sault Ste. Marie and Sault Ste. Marie to Sudbury," Elaine Della-Mattia, reported for the Sault Star on Oct. 11, 2011. "While the not-for-profit organization has been around for many years now, CAPT member David Craig said the group is realizing it needs to better build its relationship with stakeholders in order to garner more attention from government on this issue. "A big thing is to include everybody, not just big communities but small communities and First Nations and getting everyone involved," he said. Craig told city council that rail transportation is safe, reliable, environmentally friendly and can aid in local economies, prevent youth migration and increase tourism," the Sault Star reported. Michigan secures Chicago-Detroit services, Next step Detroit to Montreal? “The state of Michigan has reached an agreement with Norfolk Southern to acquire the 217km Kalamazoo - Ann Arbor - Dearborn line in a move that will secure the future of Amtrak services between Chicago and Detroit. The $US 140m purchase was funded with the aid of a Federal Railroad Administration grant and will pave the way for the upgrading of the route for 177km/h operation. The line is used by three daily Amtrak Wolverine services which link Chicago with Detroit and Pontiac,” the International Railway Journal reported on Oct. 6. "The cost to build Ottawa’s light rail line could still go up when private companies bid to build it, the federal government says, despite major changes the city has made in the past few months to rein in costs. There is “significant risk” that the current price tag of $2.1 billion will rise because changes in design standards, inflation assumptions and the outcome of tendering processes will add to the cost of the project, according to an undated memo by Infrastructure Canada officials. … The project calls for 12.5 kilometres of light rail and 13 stations to be built from the city’s west to the east end of the city, with a 3.2-kilometre tunnel planned downtown," the Ottawa Citizen reported this week.